Nozferklaatu: No. Funny thing; the Priests of R'lyeh LOST CONTACT WITH HER AROUND THE SAME TIME THAT THE ELVES WERE SEALING THEIR PORTALS. Nozferklaatu: Huh . . . Weird. Loki: You don't think . . .
Odin: Noooo . . .
Loki: I mean IF SHE WERE AN ELF . . .
Odin: Noooo . . . NO WAY! Loki: And her connection to R'Lyeh ran THRU Alfheim . . .
Odin: But the CTHULIDS HATE the ELVES for getting the BETTER of them during the PREVIOUS VAMPIRE CRISIS! WHY would they have an ELF HIGH PRIESSSSS . . .Ooooooooooo - Because "IT TAKES AN ELF TO GET THE BETTER OF AN ELF"
Loki: Well there's an easy way to find out: Just ask him. Odin: Hey Nozferklaatu, what does this High Priestess look like? Nozferklaatu: Few have seen CTHULYN because CTHULU is surrounded by MYSTERY, but I hear she's KINDA SHORT and has a REALLY NASTY TEMPER. 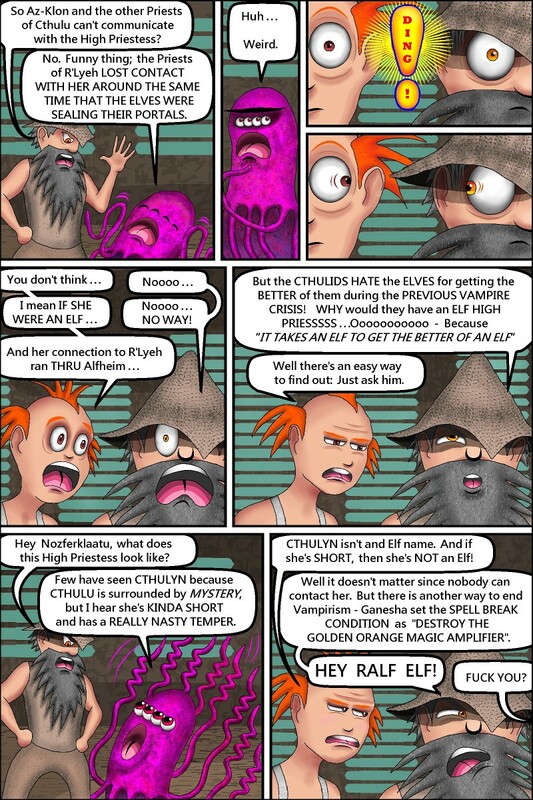 Loki: CTHULYN isn't and Elf name. And if she's SHORT, then she's NOT an Elf! Odin: Well it doesn't matter since nobody can contact her. But there is another way to end Vampirism - Ganesha set the SPELL BREAK CONDITION as "DESTROY THE GOLDEN ORANGE MAGIC AMPLIFIER". HEY RALF ELF!